It is already conventional to name the former party leaders Ed Miliband, Nick Clegg and Nigel Farage as the biggest losers of the British general election, closely followed by all the opinion pollsters and the narcissistic comedian Russell Brand. But this is to understate the abject defeat suffered by some Keynesian economists, and in particular the Nobel prize winning former Princeton professor Paul Krugman. Just days before the election, Krugman joined Brand in offering Ed Miliband a celebrity endorsement. It took the form of a long article entitled "The Austerity Delusion," which argued, rather preposterously, that the fiscal policy of the Cameron-Clegg coalition had been inspired by a cabal of Harvard economists and sinister but unnamed business interests. If only the government had heeded his "textbook" Keynesian advice and run large deficits in the past five years, Krugman argued, the UK could have avoided "major damage." Exhibit B compared advanced economies' economic performance between 2009 and 2013 with the average annual change in the cyclically adjusted primary balance, Krugman's chosen measure of austerity. The implication seemed to be that if Britain had done less austerity it would have grown as fast as Germany or the U.S. But one might equally well say that Britain did do as much austerity as Spain and Portugal, yet grew much faster. In any case, by including 2010 and omitting 2014, Krugman was shamelessly rigging his own correlation. Publishing this shoddy diatribe was a blunder on Krugman's part, as it served to draw attention to his own delusions about the UK economy - and his own embarrassing contributions to Labour's defeat. These merit closer scrutiny, as I chose to omit them from my previous assessments of his record as a commentator on contemporary events (here, here and here). It was worth the wait. Like his journalism on the United States, Krugman's writings about Britain are characterized by extreme partisanship, complemented by a touristic level of knowledge. In the pre-crisis era, he was an enthusiastic fan of the Labour governments of Tony Blair and Gordon Brown, praising them as "politicians who are serious about governing, rather than devoting themselves entirely to amassing power and rewarding cronies." Rewarding cronies with peerages was of course precisely the way New Labour financed itself. Has Gordon Brown, the British prime minister, saved the world financial system? ... The Brown government has shown itself willing to think clearly about the financial crisis, and act quickly on its conclusions. .... Governments [should] provide financial institutions with more capital in return for a share of ownership ... [a] sort of temporary part-nationalization ... The British government went straight to the heart of the problem - and moved to address it with stunning speed. TARP has of course proved far more successful than the UK's nationalization of too-big-to-fail behemoths like RBS. When Brown crashed to electoral defeat in 2010 he was "Gordon the Unlucky." "I actually admire him as a policymaker and have liked him in person," gushed Krugman. The election result elicited the comment: "UK, Yuck." By contrast, Brown's successors in Downing Street have been the objects of repeated and often spiteful attacks by Krugman - though this has necessitated some rather remarkable, not to say unscrupulous, intellectual U-turns. In March 2010, Krugman wrote a piece on his New York Times­-hosted blog entitled "Debt Is a Political Issue." It makes for interesting reading today. What, he asked, is the problem with running a very large debt of the sort incurred by the UK during the world wars. His answer? Confidence. If bond investors start to lose confidence in a country's eventual willingness to run even the small primary surpluses needed to service a large debt, they'll demand higher rates, which requires much larger primary surpluses, and you can go into a death spiral. So what determines confidence? The actual level of debt has some influence - but it's not as if there's a red line, where you cross 90 or 100 percent of GDP and kablooie ... Instead, it has a lot to do with the perceived responsibility of the political elite. What this means is that if you're worried about the ... fiscal position, you should not be focused on this year's deficit ... You should, instead, worry about when investors will lose confidence in a country. Wise words. Just seven months later, however, Krugman was firing his first broadside against the new Conservative Chancellor of the Exchequer, George Osborne, whose first budget "might have come straight from the desk of Andrew Mellon," the U.S. Treasury Secretary during the Great Depression. According to Krugman, by imposing steep cuts in public sector employment, Osborne was worrying needlessly about something called "the confidence fairy." This was a term Krugman had coined to ridicule economists (other than him) who argued for responsible fiscal policies aimed at stabilizing public debt. The fact that Krugman himself had previously emphasized the importance of investor confidence was magically effaced, presumably by the confidence trick fairy. In August 2011 Krugman returned to the fray with a blog post about the "delusions" of new Chancellor of the Exchequer, George Osborne, whose "experiment in austerity" was "going really, really badly." Three months later, in October 2011, Prime Minister Cameron's "fantasy" - that fiscal retrenchment was strengthening investor confidence in UK gilts - was given the same contemptuous treatment. Unfortunately for Krugman, the more he talked about the confidence fairy (as he did here and here and here and here and here and here), the more actual business confidence recovered in the UK. In fact, at no point after May 2010 did it sink back to where it had been throughout the last two years of Gordon Brown's catastrophic premiership. The low at the end of 2011 (Q4-11 to Q1-12) was followed by lift-off in mid-2012 and a peak in mid-2014. Source: Grant Thornton, "UK Business Confidence Monitor," Q1 2015, p. 2. Along with the confidence fairy, a recurrent and equally misleading feature of Krugman's UK commentary has been his claim that the UK's economic performance in the past five years has been worse than during the Great Depression (see here and here and here and here and here and here). Once again, however, the truth will out, even in Krugman's own blog. 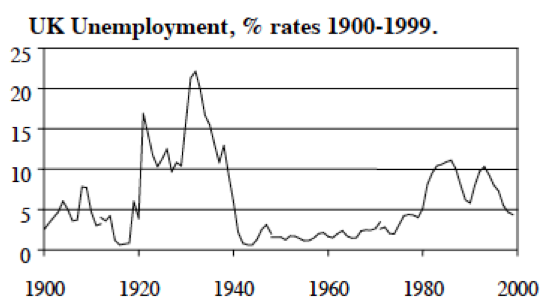 In November 2011 he made the mistake of publishing a long-run chart of UK unemployment, showing that the rate exceeded 20 percent in the 1930s and was never less than 10 percent throughout the interwar period. For the record, UK unemployment peaked at 8.5 percent in September-November 2011. It has fallen steadily since then. The current figure is 5.6 percent. Source: "A Century of Change: Trends in UK Statistics since 1900", House of Commons Research Paper, Dec. 21, 1999. Note that the interwar definition differs from today's. The peak rate of 22% in 1932 would probably be closer to 10-16% if the modern definition is used - still higher than at any time in the last five years. Economists like models, and Krugman loves his own. The point about such models is, however, that they have to make accurate predictions about the future to have credibility. So how did Krugman's model do when it came to the UK? The answer is: disastrously. October 2010: "Fiscal austerity will depress the economy further unless it can be offset by a fall in interest rates. ... The best guess is that Britain in 2011 will look like Britain in 1931, or the United States in 1937, or Japan in 1997. That is, premature fiscal austerity will lead to a renewed economic slump." November 2011 ("Bleeding Britain"): "What's happening in Britain now is that depressed estimates of long-run potential are being used to justify more austerity, which will depress the economy even further in the short run, leading to further depression of long-run potential, leading to ..."
April 2012: "Britain will continue on a death spiral of self-defeating austerity." May 2012: "Britain's unnecessary turn to premature austerity is becoming a historic policy and political disaster that will haunt the country for years." May 2012: "The Cameron/Clegg/Osborne decision to engage in unforced austerity, which increasingly looks as if it may cripple the UK economy for many years to come." September 2012: "Britain's recovery stalled soon after Cameron/Osborne began their new policies, and the country is now in a double-dip recession." In fact, there was no double-dip recession, a fact Krugman strangely omitted to communicate to his readers. On the contrary, the growth rates for the UK in these years (according to the International Monetary Fund) were 1.6 percent (2011), 0.7 percent (2012), 1.7 percent (2013) and 2.6 percent (2014). In that last year, the UK had the fastest growing economy of all the G7 countries. The final piece of Krugman's analysis was that Cameron and Osborne were "so deeply identified with the austerity doctrine that they can't change course without effectively destroying themselves politically." They had "to stick it out until something turns up, no matter how many lives it [austerity] destroys." Cameron was "the English prisoner" of his own "austerity crusade." In fact, the government did change course, significantly easing the fiscal tightening in late 2012. Krugman was at first dismissive of these changes as "a set of basically minor twiddles involving credit and planning authorizations, which seem highly unlikely to make any significant difference." When these "twiddles" turned out to make quite a lot of difference, he cried foul. Why, Cameron and Osborne had stopped doing austerity after two years! How dare they not fulfil Krugman's apocalyptic predictions! Krugman has spent much of the last two years trying to dismiss the UK recovery - not surprisingly, as it makes nonsense of nearly everything he has written in recent years. It was, he insisted in September 2013, a "dead-cat-bounce." The government's claims of success were "deeply stupid." The economy's growth was merely the effect of stopping "banging Britain's head against the wall." Comically, in January 2014 Krugman sought to argue that France was the role model Britain should have sought to emulate. By April, however, he had thrown in the towel, but in a typically dishonest way. "The fact that the [UK] economy has perked up," he argued shamelessly, "is actually a vindication of Keynesian claims, whatever the government's intentions." The return to growth - the one he had wholly failed to predict - was "not at all surprising." There was "nothing here that warranted a major revision of framework." Perish the thought! Let us just be clear. Paul Krugman predicted that George Osborne's policies would devastate the UK economy, producing results worse than those of the 1930s. The outcome? More than 1.9 million jobs have been created since May 2010. The UK unemployment rate is now roughly half the rates in Italy and France. In nominal terms, weekly earnings are up by more than 8 percent; in the private sector, the figure is above 10 percent. Inflation is below 2 percent and falling. Meanwhile, the government's policy of fiscal stabilization, so derided by Krugman, has in fact been a success. According to the IMF, the government's deficit has been halved from 11 percent to 5.7 percent; the structural deficit more than halved from 10 percent to 4.2 percent. The national debt has been stabilized at roughly the same level relative to GDP as that of the United States. In the words of Jeffrey Sachs - hardly a conservative on economic issues - UK economic performance has in fact been "broadly similar" to that of the United States, "with the UK outperforming the United States on certain indicators," such as the employment rate (now at a record high of 73.3 percent compared with 59.2 percent in the United States). As Sachs notes, "both the U.S. and UK economies have cast considerable doubt on Krugman's oft-repeated view that a robust recovery would require further fiscal stimulus." Amen. Of course, Krugman was not alone. Martin Wolf of the Financial Times made much the same arguments. So did Simon Wren-Lewis, Jonathan Portes and others. However, none of these Keynesian authors could match Krugman's unique combination of over-confidence and toxic rudeness. It was not enough to sneer at George Osborne's policies; he had to be compared gratuitously to one of Monty Python's "upper class twits." Osborne's consistency - a trait Krugman greatly prizes in himself - was "the hobgoblin of little minds, adored by little statesmen." His policy was "a complete conceptual muddle." Osborne was "the Rt. Honorable Saboteur." The government was like "the Three Stooges." Osborne's 2014 budget was "ludicrous." Krugman is of course in thrall to an Englishman who cannot be credibly described as anything but upper class: John Maynard Keynes. In his vainglorious dreams, Krugman is the Keynes of our time - brilliant, caustic, influential. In his journalism, Krugman frequently alludes to his hero's work - hence "The Economic Consequences of Mr. Osborne." But to be Keynes you need ultimately to be credible - credible enough for policymakers to pay heed to what you say. In this regard, Krugman's career is a story of catastrophic failure - a failure only partly explicable by the fact that, unlike Keynes, he is personally obnoxious. Amongst many offensive traits, Krugman's chronic inability to acknowledge error is the most troubling to policymakers, who are subjected to far more rigorous scrutiny than he is. Accusing other economists and the Financial Times of "perceptual sleaze," Krugman recently had the gall to write: "What's not OK is blurring the distinction between ... political analysis and a real analysis of how policy worked. ... When people do that kind of blurring to make the case for policies they prefer, it's deeply sleazy, no matter who they are." Lack of self-knowledge on this scale borders on the pathological. It is easy to forget how seriously the British Left once took Krugman. In a speech for Bloomberg in August 2010, Ed Balls named him as one of the few intellectuals who were prepared "to stand up now and challenge the current consensus that - however painful - there is no alternative to the Coalition's austerity and cuts." Less than a year later, in a speech at the London School of Economics, Balls again made his debt to Krugman clear. And in his 2012 party conference speech, he went the whole way, parroting Krugman's prediction of a double-dip recession. This was the peak of Krugmania in the UK. In a gushing editorial in January 2013, the Guardian even urged Ed Miliband to appoint Krugman as Shadow Chancellor. Krugman lectures were now attracting throngs of credulous devotees - though Balls was no longer among them. He had belatedly - but too late - woken up to the fact Krugman's predictions had been worthless. Of course, if no one in power ever takes your advice it is quite hard to be proved definitively wrong. There will always be the unknowable Krugman counterfactual: in the British case, the bigger deficits that were never tried, in the U.S case the bigger stimulus that was never tried, in Europe's case the doubling of the inflation target that was never tried. Happy the economist whose policy prescriptions are so reckless that no one ever puts them to the test. Except that one country, just lately, has been putting a Krugman recommendation to the test. That country has defied the "austerians." It has thumbed its nose at the fountainheads of economic orthodoxy. It has dared to play chicken with the confidence fairy. It has even told the Germans where to get off. And it has done this on the basis of Paul Krugman's advice, spelt out when he visited the nation's capital, at the government's invitation, in April. Niall Ferguson is Laurence A. Tisch Professor of History at Harvard and a Senior Fellow at the Hoover Institution, Stanford.